That’s the conclusion of a new paper in Physical Review E, which fingers an unexpected change in the ring’s air resistance as the culprit, according to lead author Mir Abbas Jalali, a physicist who studies applied mechanics at the University of California, Berkeley. “All major discoveries of rigid body dynamics had been made in the 18th and 19th centuries, and we thought this is a rare phenomenon that remained unnoticed for decades, and maybe centuries,” Jalali told Gizmodo via email. Jalali stumbled on this puzzling behavior while pondering a different research problem in his office. He absent-mindedly removed his wedding ring and spun it on his desk, and was surprised to see that it made a retrograde turn as it spun, more like the flight path of a boomerang than the coins he usually spun while deep in thought. A few weeks later, his Berkeley colleague Reza Alam — a co-author on the new paper — invited Jalali and his wife to dinner, and Jalali demonstrated the effect. It was Alam who suggested they conduct experiments and film various spinning rings to better plot their trajectories. See how the path of the spinning ring gradually starts spiraling back? It’s reminiscent of how a boomerang eventually reverses direction to return to the person who threw it. 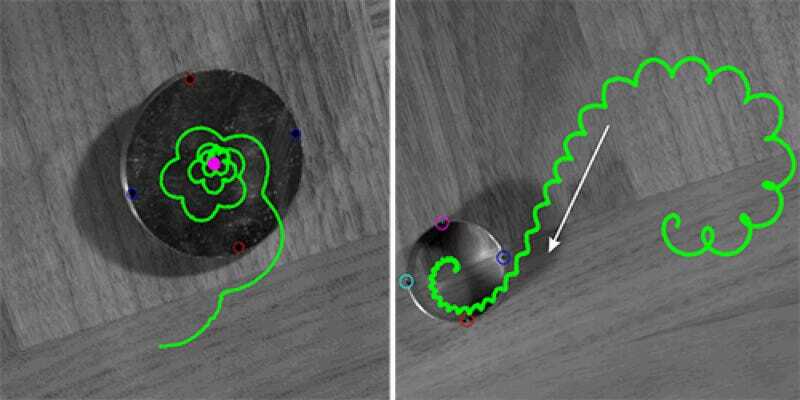 The key to this behavior in boomerangs is known as gyroscopic precession. One wing moves through the air faster than the other as the boomerang travels forward, creating an imbalance of forces: there is more lift on the top wing, and that difference gives rise to a torque, causing the boomerang to loop back around during flight. The explanation for the wedding ring’s behavior is a little different. A spinning coin will trap a thin layer of air between its bottom edge and the surface on which it is spinning. The same thing happens when you spin a ring, except now you have a big hole in the center. That gives the air an escape route, and it flows through the hole, changing the frictional forces so the spinning ring switches direction. It’s often said that scientific discovery begins not with a triumphant cry of “Eureka!” but an unexpected observation punctuated by a puzzled, “huh.... that’s funny.” And it helps to foster a sense of play along with natural curiosity. Jalali’s story of noting something unusual when he spun his wedding ring reminded me of a famous Richard Feynman anecdote. When he was a young physics professor in Cornell in the late 1940s, Feynman was in a creative slump, science-wise. One day he was lounging in the school cafeteria when a prankster threw a plate in the air. It bore Cornell’s trademark red medallion seal on the rim, and Feynman noticed a distinct wobble as the plate went up in the air. He also could see the red seal spinning around. The wobble of the plate was faster than its spin. Intrigued, Feynman calculated the exact ratio between the two, and found that this effect occurred when the plate was angled very slightly. When colleagues questioned the point of the exercise he insisted it had no importance: “It’s just for fun!” But it pulled him out of his creative slump, and he went on to win a Nobel Prize. Jalali, M.A., Sarebangholi, M.S., and Alam, M-R. (2015) “Terminal retrograde turn of rolling rings,” Physical Review E, 92: 032913.